Dana Nance thought that for the last couple of years she was renting her Houston-area home to a nice woman with a child and two younger brothers. Then, this week, the home was raided by the Drug Enforcement Agency as part of a takedown of major marijuana grow operations. 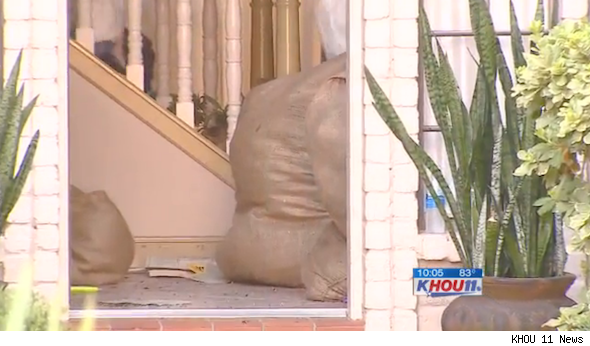 Nance's home was one of 50 filled with pot plants and rigged with equipment to grow them, Houston's KHOU 11 News reported. Now, Nance has learned that the woman she thought she was renting to actually lives in Washington state. "They hired this woman that, specifically, this was her job -- to go and rent properties," Nance told KHOU. "She checked out on every level. She had good credit. She had a job with references. She had a a good rental history." Nance said she did notice some weird things over the last couple of years. For example, the neighborhood HOA asked that weeds in front of the home be removed. Nance's neighbor told her that the tenants pulled them up in the middle of the night using a car's headlights to see. After learning of the DEA bust, Nance said: "I immediately thought all the things that had been odd, [they] kind of make sense now." Investigators believe that Nance's tenants were part of pot ring specializing in growing high-quality marijuana, according to KHOU. Nance hasn't been allowed to enter her home to assess damage because the DEA is still investigating whether she was involved in the scheme. Are you thinking of renting your home out? Take Nance's advice: "Get references on your references. You have to make sure you're speaking to the employer. "It's possible her rental reference was a scam," she added, referring to the woman she rented the house to. Marijuana grow houses seem to be popping up more and more. There was the case of a Bainbridge, Ga., home with a full-scale marijuana grow operation hidden underneath. And in Riverside County, Calif., earlier this year, firefighters discovered a huge marijuana grow operation inside a home that had burned.